Japan looked like the model for economic recovery – until yesterday. On Monday we learned that the world’s third largest economy unexpectedly fell into recession last quarter. Analysts squarely lay the blame on April’s sales tax hike. The increase in Japan’s consumption tax from 5% to 8% was implemented to help rein in the country’s debt, but it ended up hampering consumer spending which accounts for two-thirds of that country’s economy. 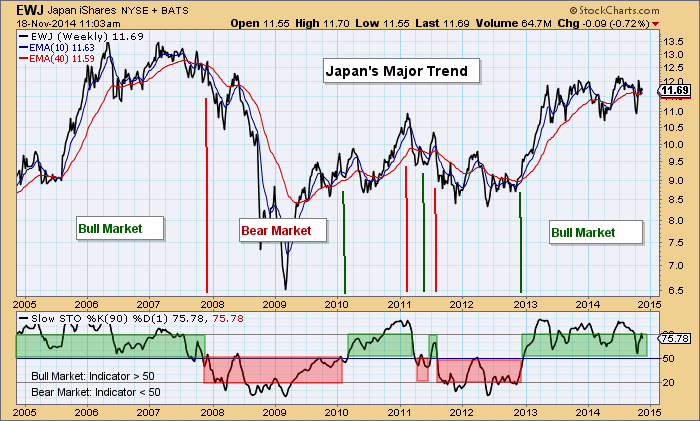 The diminished outlook for Japan’s economy is impacting Japanese financial markets. iShares MSCI Japan (EWJ), a $14.8 billion exchange-traded fund which serves as my proxy for the Japanese stock market, is experiencing an intermediate-term momentum tug-of-war (shaded area, top chart). However, as you can see below EWJ’s major trend is bullish and when viewed in that broader context, odds favor higher prices in the weeks ahead. 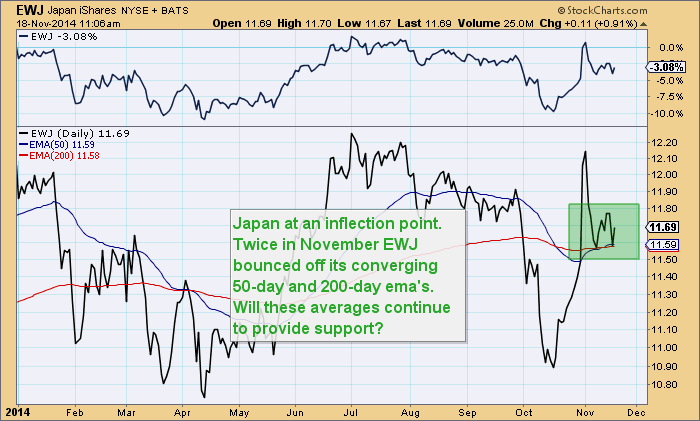 My newsletter’s timing model for Japan Funds generated a buy signal on October 31.